The words in this post reflect my personal feelings regarding the tragic events that happened in my beloved adopted home country this week. It was difficult to write them down, my children safely running and laughing in the house, while others suffer a great loss. I also ask myself if this tragedy can be put into words and if yes, which words are the appropriate ones? Wildfires swept through the town of Kinetta and the resort town of Mati near Athens, killing at least 85 people and injuring more than 150. Mati is a known tourist hotspot, especially for young families and the elderly. Men, women, children, and families with babies were trapped while trying to flee the flames. Others drowned in the sea trying to escape the fires. The Rafina/Marathon region, where Mati is located, is a favourite area for me and my children to visit. Only 30 minutes away from our house in Athens. I have often used photos of my kids playing at the beaches of Marathon and Rafina on my social media, publications about Greece, on my blog and in articles for others. The proximity and the familiarity with the town and beaches make it very difficult for me to deal with these tragic events. Today I was thinking about my blog, my travels, and my favourite places in Greece for families with children. My blog is a passionate effort to share places and to inspire families to visit Greece and enjoy her beauty. 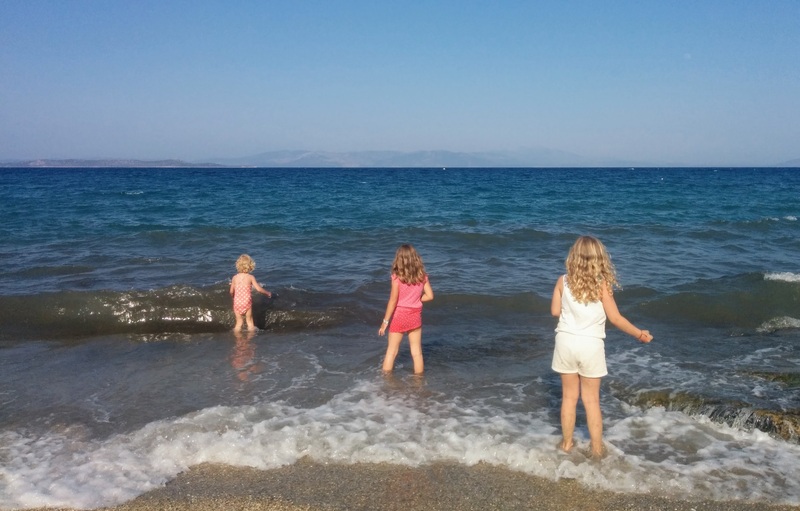 How can I continue posting happy beach photos of my kids in Greece while other families are still searching for their missing loved ones and many found have not yet been identified? How can I inspire others to visit Greece while I am not in the mood to visit the beach myself? And how can I post anything positive to inspire others while I am feeling so sad? I also realized that I missed posting on my blog. My blog is a personal blog, a creative outlet, a project with real stories of places visited by me and my children. My stories are real and this week, the tragic events are the reality. A reality that everyone will have to deal with. Greece is still a wonderfully beautiful country. Hospitable, warm and passionate. A country that is safe for families. Kids are welcome everywhere and the Greek beaches are very child-friendly. There is so much to see in this beautiful country. These are some of the reasons that I have chosen to live here for 25 years now. The people in Athens are mourning, trying to find the missing persons and assessing the damage caused by the raging fires. Friends from all over the world have shown great support and empathy with Greece. The messages that I have received on social media these days are heartwarming. My thoughts and prayers are with the families who suffered from this great tragedy. But I also realize that thoughts and prayers are not enough to deal with the solution of the problems that caused these tragic events. What is important that we do not stop supporting Greece.